Ethan wakes up… “good morning Ethan! How’s my guy?”, “no mom, don’t talk to me…” okay…, I don’t say another word to him until he prompts me. Leaving the house in the morning, I open the door, “no mommy, I wanted to open the door! !” he screams throwing himself on the floor. He has to brush his teeth first, then I can have a turn. Some days, it’s the wrong toothpaste… Some days, I put a bowl out, he wanted to get the bowl, tantrum ensues. Some days it’s really like walking on eggshells, you don’t know what will set him off. When we get home, he has to ring the doorbell before we open the door. The other day he was asleep in the car, I carried Stella inside the house, went back to the car for him, he woke up, saw the door was open and lost it. I had to close the door, he rang the doorbell, then we could go inside. I wrote the above post about 7 months ago. I’m sad I haven’t been posting much, but it is what it is, we’ve been busy. We just got back from a trip to Moorea with the family. We traveled with Ethan 3 1/2 and Stella 13 months. Overall we had a great time, but I will have to say, traveling with small children definitely has its challenges. We took a red eye there and back, Ethan was great because you can pop an iPhone in his hand or put on a movie and he is instantly engaged. Stella was awake for 2-3 hours of the flights and she wanted out of her seat. She kept kicking the seat in front of her and the man that was sitting there kept giving me the evil eye. We flew Air Tahiti Nui, I was very impressed at how they cater to children. They had activity bags for the older kids, and baby food, diapers, wipes, baby powder etc. for Stella. Stella has such a sweet personality. She always has a smile on her face. She has walking down pat, can go up and down the stairs and has started trying to jump. She just started in a new classroom at school and she really seems to be enjoying it. When I picked her up last week she was practicing drinking from a cup, it was very cute! She is also sleeping on a cot at school rather than a crib, and seems to be going well. She still takes 2 naps a a day, around 10 & 2. She loves her big brother, anything he says or does makes her laugh. She says thank you, peek a boo and uh o. She loves bananas, pasta & strawberries. Anything I’m eating she wants too. She is very independent and will play by herself for quite long periods of time. Stella had her first official swim lesson on Saturday, she is a water baby! She loved half of it and then got tired of being on her back. She will be going every Saturday until she’s a swimmer. She is Ethan’s twin. Everyone that sees them together mentions it. Ethan is much improved since my last post. Don’t get me wrong, he still has his moments, but he has really grown up. There is no baby left in the guy. He and Jarrod go fishing a lot, which he loves. He just started a new year at school last week. I’m excited to see what he learns this year, he is a smart cookie. We have him enrolled in music and soccer and he loves both. 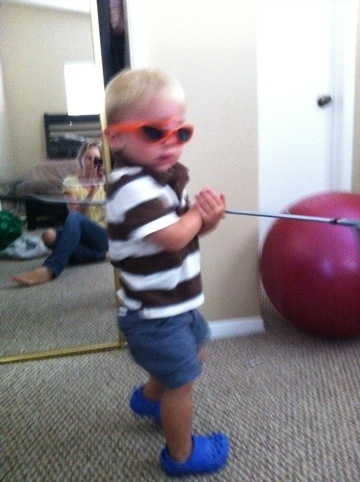 He seems to be pretty athletic, loves to go to park and play golf and baseball. I’m looking forward to when he’s 4 and can begin little league. Ethan is officially a swimmer, though his confidence hasn’t caught up with him yet. He will swim circles around the spa, but is too scared to swim solo in the pool. He is much more interested in playing with other kids now. When he’s with other kids his age he gets pretty silly. He loves Jake and the Neverland Pirates, Cat and the Hat and most recently Veggie Tales. He watched The Wizard of Oz with Jarrod a few weeks ago and loved that too. He has been reciting very specific parts of the movie to us, his memorization is incredible. My due date is 4 weeks from today! I couldn’t be more excited! I reeealllyy hope that miss Stella decides to arrive early and not late. My back pain has miraculously gone away (for the most part). I still have heart burn, have to pee constantly and my left ankle has been swelling with both ankles feeling achy. I’ve gained 24lbs. Hoping that I don’t gain anymore as I have gained as much as I did at the end of my pregnancy with Ethan. Today was Ethan’s 4th swimming lesson. His instructor says that he’s doing really well. The first lesson he was cautious, but didn’t cry. 2nd and 3rd lessons, he cried quite a bit. Today, he was very cautious, but only cried when his instructor put his head under the water. He likes and feels comfortable floating on his back. Last night we took Ethan to see his first movie at the theatre, Madagascar 3. He did really well! For the first 30 minutes he wouldn’t even grab popcorn he was so focused on the movie. He did well up until the last 10 minutes, when we left. Ethan is still full of sass and is very sweet until we stop him from doing something he wants to do or tell him to stop a behavior. Being at the end of my pregnancy and pretty tired, I do let a few things slip, but we are trying really hard to be consistent and discipline him as much as possible. One thing that really works with him is saying if you listen and do x, y & z, you’ll get a special treat. Bed time has been a breeze as we have our routine down. He sits for a couple of books in our lap on the rocking chair, hops in bed, we tuck him in, read a couple more books from the chair, hug, kiss say good night and leave. Nap time is another story… It is a battle every weekend. Probably because no weekend is the same so he can’t count on the same routine. Not sure how to fix that? But hopefully in time it will get easier. Ethan has been singing for quite some time, but he’s been singing a ton lately. Some of his favorites are bumble bee, itsy bitsy spider, BINGO, Old McDonald and twinkle twinkle. For the past month or 2 Ethan has been all about the Ipad and Iphone. He knows how to do everything on both from turning the volume up or down, to finding where his apps are to navigating all of his apps and starting movies. We are going to have to start regulating and limiting the time he spends on there. If we let him, he’d probably be on them all day. 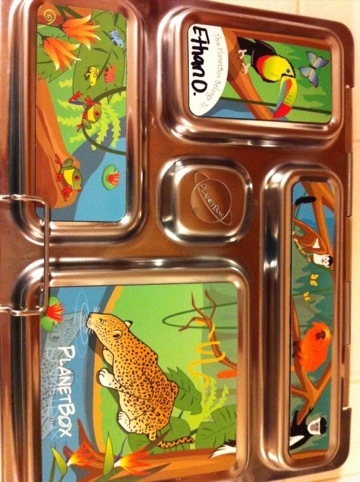 A big thank you to Jarrod’s cousin for introducing us to the Planetbox lunchbox! We love it and would highly recommend it to all families with preschoolers. 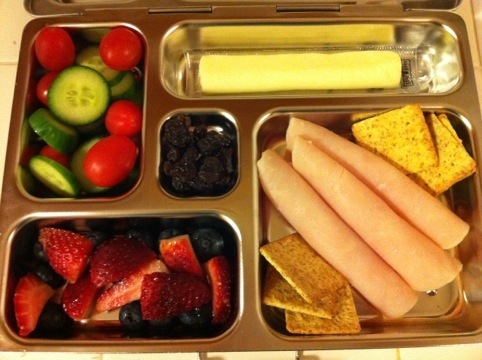 Planetbox has a Facebook page with lots of fun lunch ideas too! Ethan 21 Months and the month of October. Well, I’m a few days late on Ethan’s monthly update. That would be because things have been busy around here! A week and a half ago we flew up to Sacramento, dropped Ethan off with grandma and grandpa and drove up to Napa to celebrate our 4 year anniversary. We had a really fun time! Napa wasn’t everything I thought it would be, but it was still a nice trip and we will be back. How can you go wrong with wine tasting right?! We stayed at Vino Bello, which was OK, but I probably wouldn’t stay at again. They tote themselves as a 4 star, but I would describe the resort as an upgraded Holiday Inn. We hired Napa Bee Driven. They are a company that drives your car around for you rather than renting a limo or going in a shuttle. I would highly recommend them! Our driver was great and very knowledgeable. Their rates are much more reasonable than renting a limo. The first night we were there we splurged and went to dinner at La Toque, it was very good, but probably only somewhere we would go once. On our wine tour we went to Mumm’s, Del Dotto and Rubicon. So enough about us… What has Ethan been up to? Well, he did great on our flights to and from Sacramento, it was his fifth flight. And, he has really been wanting to use the potty. We bought a seat to go onto the toilet and he (in so many words) tells me he wants to go potty. I put him on the toilet and he will literally sit there for 20 minutes, probably longer if I let him. The last time he sat there, he grabbed toilet paper and tried to wipe in the front and back (sorry if that’s too much information). The things they pick up! Today in the bath he told me “pee pee” while he held his bottom. He wanted to sit on the potty. He’s cried wolf to me too many times for me to know that he really didn’t need to go potty. He just wanted to sit there to try. Poor guy, I hope he’s able to figure it out soon! He has a book called “Potty”. I caught him reading it today and it was one of the cutest things I’ve ever seen. As he turned the pages he was reading (from memory and pictures). “Bye Bye Diaper” and “Hooray” which were pages in the book. I’ll have to try and get it on video. We took Ethan to the pumpkin patch a couple of weeks ago. That was quite the experience. Ethan was so overwhelmed with all the activity there that we had several meltdowns. He would go from really excited to really distraught in the blink of an eye. Overall he had a good time though. When we download the pictures from our camera, I’ll post some. He went on a carousel and on a horse. On the horse he looked pretty confident and really excited…. until the horse started to move. It was so sad. His little lip went down and then he started balling. Needless to say he was removed from the horse as soon as possible. Yesterday was Halloween and his school had a carnival and parade. He was a dinosaur, and got to go to school in his costume. There were definitely some tears about putting it on, but he did it and he looked adorable. When we got to school and he saw all his friends in costume he was pretty excited. He kept on saying Halloween and Trick or Treat. His day at school was pretty fun filled so we decided not to take him trick or treating. I felt bad but he’s still so little and by the time we got home and finished dinner it was already 7:30. Plus, I had to make a grocery store run on the way home so you can imagine how excited he was about that :). Ethan has been putting lots of words together. 2 and sometimes 3 words for the most part. My favorite phrase of all is “open it”. He sounds so cute saying it. He also says “I love you”. Not voluntarily, but he will repeat it if you say it. We bought Ethan play doh this weekend and he LOVES it!!! If you have a 21 month old and don’t already have it, it’s a must have item. It will keep them occupied for 45 minutes (that’s a really long time in our house). We also bought him a table and chairs that are his size. We are hoping to set up more of a Montessori environment in our home within the next couple of weeks. We have way too many toys around here and a lot of them aren’t “Montessori approved”. One more update. Ethan is missing 4 teeth, plus his molars. I think they will soon be making an appearance because he has been drooling like crazy and seems to be in pain. Please wish us luck! 1.He waves his hands at imaginary flies. It’s that time of year again when the flies are everywhere! The past few days I’ve been swatting fly’s with my arms. Ethan doesn’t realize what I’m doing, so he will just randomly wave his arms around in the funniest motion thinking it’s something normal that people do. 2. A couple of days ago we were reading a book that showed a cow eating corn, Ethan ran into the kitchen and started saying “corn” “corn”. We didn’t have any and I felt bad, he started crying because he REALLY wanted some. 3. He says 95% of the sounds of the alphabet and he recognizes some letters. 4. It’s football season and Ethan loves it. He holds a football during the games and he slept with one the other night. When I came in to wake him up in the morning, he woke up, picked up the football and threw it to me. He calls the football apball. 5. We finally took his crib apart and made it a big boy bed. He’s doing great in it and hasn’t been getting out once he’s in. I took Ethan to get some shots today, he’s a little bit behind on them because I’ve been doing an alternative vaccination method. He weighs 25 lbs and is 32″ tall. He was a little trooper and got a lollypop for his efforts. 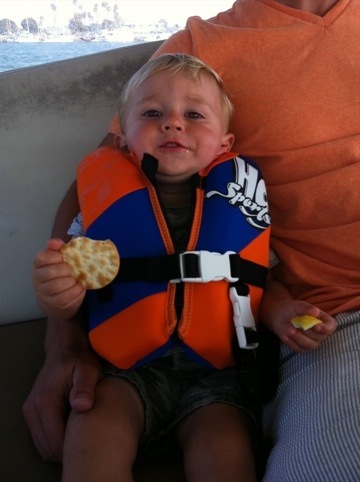 Yesterday was Ethan’s 19 month birthday…. and here’s what’s new…. The last 2 days he’s been excited to go to school. Yesterday he stood at the front door with his backpack aka lunch box blowing kisses to dad saying “I’m ready to go”. When we got there, he walked over to a friend and didn’t give me a second look. When I came to pick him up, he was throwing a football and started crying when I picked him up, he didn’t want to leave. The best thing I could ask for!! Today, a couple of tears when we left the house because he didn’t want to leave dad, but when we got to school, off he went on the playground. He didn’t even give me time to zip his sweater. Ethan looked a bit silly today because he’s all of a sudden very particular about what he puts on and what he wants. Last night he took some crocs out of his drawer, and wanted Jarrod to put them on him. They were inseparable after that. I tried taking them off when he went to bed and he started throwing a tantrum. So he slept in the crocs. This morning Jarrod tried taking them off to change him, another tantrum… So, he wore the crocs to school (which are too large for him) and that we bought for the beach/pool. Ethan also has 3 favorite shirts; one with a football, Thomas the train and a car. He loves them! If he spots them, he will grab them and insist that I help him put them on. I can ask Ethan to get a book for me to read with him. He runs to his room and brings one back. I then tell him to put it back before grabbing another one, and he will. Ethan’s working on 3 new teeth. Before we know it, he’ll have a full set. As we speak, he’s in his crib singing. 19 months is a great stage, he’s so much fun! Well, it’s been a few weeks since my last post, mostly because it has been crazy busy in our house! 2 weddings, family in town etc. Ethan is adjusting well to his new Montessori school. It’s been almost a month already, which is hard to believe. Summer school ends the end of next week, and the new school year starts on September 7th. A couple days after the new school year, the school is hosting an ice cream social. We’re looking forward to that, to meet with the teachers, families and kids that will be in Ethan’s class. There will be 12 kids in his class and 2 teachers. Each week there’s a new development. Ethan has mastered drinking out of a regular cup, though we still give him a sippy cup at home if he’s walking around with it. Binky’s are done with!! Which has been great, and Ethan’s biggest accomplishment to date is escaping his crib! We put Ethan down for a nap about a week and a half ago, and the next thing you know he came strolling into the kitchen… We were so confused and blamed Granny (who was staying with us for the week) for taking him out of the crib. Well turned out it wasn’t her, and after many escapes to follow, we realized this was here to stay. Jarrod will be installing his toddler bed this weekend which will be a bit safer for him when he does get out of the bed. Each week in Ethan’s summer school program there is an emphasis on a new sport. So far Ethan has learned soccer and basketball. He surprised us with some pretty impressive soccer moves out of the blue the weekend before last. I didn’t realize how much an 18 month old could pick up when it came to the coordination of kicking a ball. He seriously looked like a little pro. He kept kicking the ball into the wall as if it was his goal. When I picked Ethan up from school today his teacher told me that he is finally learning how to pick up after himself and put away the toys he is playing with. Hallelujah!!! I could not be more excited and will be reinforcing this at home. Prior to today she said he made a little trail of destruction everywhere he went which is exactly what we were dealing with at home. Well, that’s all for now, hope you all enjoy the rest of your week! PS. Don’t forget to vote for us on Top Mommy Blogs. All you have to do is click on the icon on my blog page.